President Yar Adua left Nigeria for treatment abroad on November 23rd, 2009 and has not been seen in public since then; even though he is said to have returned to the country on February 24th of this year. As a result of the perceived power vacuum created by his absence, the vice-president Goodluck Jonathan was made the Acting President of the country by the National Assembly on February 9, 2010. While the appointment of the Acting President generated both positive and negative responses from the citizenry, many Nigerians have argued for a more permanent solution to the political uncertainties generated by Yar Adua’s illness. Specifically, there have been calls for the Federal Executive Council (FEC) to declare the president incapacitated as provisioned for by section 144 of the Nigerian Constitution. 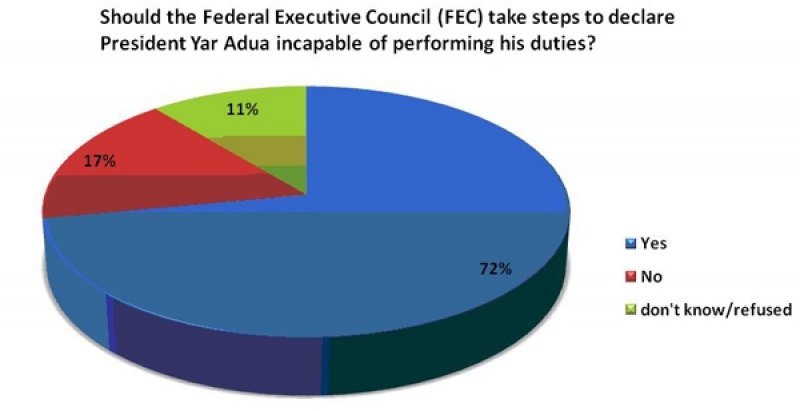 In a recent survey of the general population conducted by NOI Polls, 72% of respondents questioned in our survey answered ‘yes’ to the question “Should the Federal Executive Council take steps to declare President Yar Adua incapable of performing his duties?”. 11% of respondents said ‘no’ while 17% either refused or were unable to answer the question. The findings of this survey indicate that Nigerians want a lasting solution to the political concerns generated by President Yar Adua’s ill health. Respondents for the snap poll were randomly selected from a database of phone-owning Nigerians aged 15 and above, compiled by NOI Polls. 2,058 people took part in the telephone interviews from the 8th and 14th of March, 2010. For a sample of this size, we can say with 95% confidence that the maximum margin of sampling error is ±2.2 percentage points. The margin of error reflects the influence of data weighting. In addition to sampling error, question wording and practical difficulties in conducting surveys can introduce error or bias into the findings of public opinion polls.